Sold by Sourceton AU and Fulfilled by Amazon. Gift-wrap available. 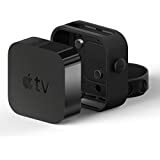 SIMPLE-Mount for Apple TV 4th and 4K 5th Generation(Apple TV and remote not included). PROTECTIVE CASE for REMOTE-Skid-proof&anti-scratch,the case is durable and strong, which can provide long-lasting protection for the remote,works great for scratch protection and light drops,makes the remote easier to grip and less likely to slide. 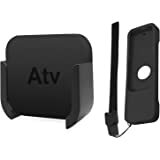 CONTENTS-1XApple TV Mount(Compatible with Apple TV 4th Generation/4K 5th Generation Only);2XSilicone PROTECTIVE CASE for REMOTE(Blue&Black);2XScrews;2XWall Anchors;2XDouble-Sided Adhesive. 1.The design of the mount allows easy access to ports and cords. 2.You can mount where you want. 3.You just need to install it in 3 easy steps. 4.The slot hole design provides flexible position for installing screws. 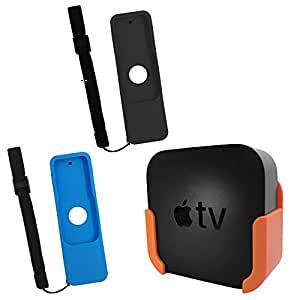 5.PROTECTIVE CASE for REMOTE,furnishing full coverage,cutouts fit great and ensure that all buttons can be normally used,and provides a great protection to every edges and corners of the remote. no regrets here. just go for it. my ApTv4k is mounted on the wall behind the TV. For the people that complained about it fallowing, is because they don't take in consideration that TVs push a LOT heat and the adhesive just melts. My son's TV is like a fireplace. No wonder nothing can stick on the back of the TV. I suggest you to add to the wall on the back and problem solved. It might to be a solution for everyone but at least you have an idea. 5.0 out of 5 starsGreat accessory for my ATV 4K for the buck! I'm really happy with this product, perfect fit for my new Apple TV 4K plus the remote control skin is the best bundle for the money. Pretty easy to install (Screwed on the wall), I didn't try the velcro strips because I didn't intent to stick it behind the TV but I won't recommend it after so many reviews, at least you get somtehing stronger like 3M. I browsed for remote skins only and came across this bundle with the mount. Best bang for the buck. A few are complaining about the Velcro strips, but from my experience, it looks very strong. Should hold as long as you hold firmly and for a few seconds to get that bond. Thankfully, my tv has a small little pocket where it can be held to the wall by it because the tape on this did not last an hour on the wall and taping to the tv didn’t work either. If I wanted to make holes in my wall, I would’ve just put black screws in the wall around the apple tv itself.